A native Texan, J. Don Gordon devotes the bulk of his practice to litigation. Board Certified in Civil Trial Law by the Texas Board of Legal Specialization for 28 years, in 2003 he was named a national finalist for Trial Lawyer of the Year by the Trial Lawyers for Public Justice. Mr. Gordon graduated with high honors from the East Texas State University in 1974 and earned his law degree from the University of Texas at Austin in 1977. He is an AV PreeminentTM Peer Review RatedSM attorney by Martindale-Hubbell, a rating reserved for attorneys whose peers believe them to have the highest level of legal skill and integrity. 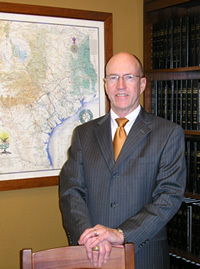 He has been a member of the College of the State Bar of Texas for more than 20 years. In 1991, Mr. Gordon co-founded Hynds & Gordon, P.C.